New York police ramp up security at British sites across the city after a “terrorist incident” on Westminster Bridge and outside the Houses of Parliament in London, which left four people dead and about 40 others injured. Heavily armed officers and bomb-detecting dogs were deployed to the British Consulate, British Mission to the United Nations, City Hall and Grand Central Terminal. "You'll see a larger presence of the dogs at these locations, as well as [officers] armed with the long guns," said James Waters, the police department's counterterrorism chief. Police are concerned about copycat assailants, but there was no specific threat to New York City on Wednesday, Police Commissioner James O'Neill said. The stepped-up security comes after the British parliament was suspended and put on lockdown Wednesday. Four people died and at least 20 others were injured in what British police are calling a “terrorist incident” when a car drove into pedestrians on Westminster Bridge on Wednesday afternoon before crashing into the gates of Parliament. In a separate incident, a man stabbed a policeman with a knife, then ran toward the House of Commons before two plain-clothed policemen shot him, according to an eyewitness who spoke to the BBC. 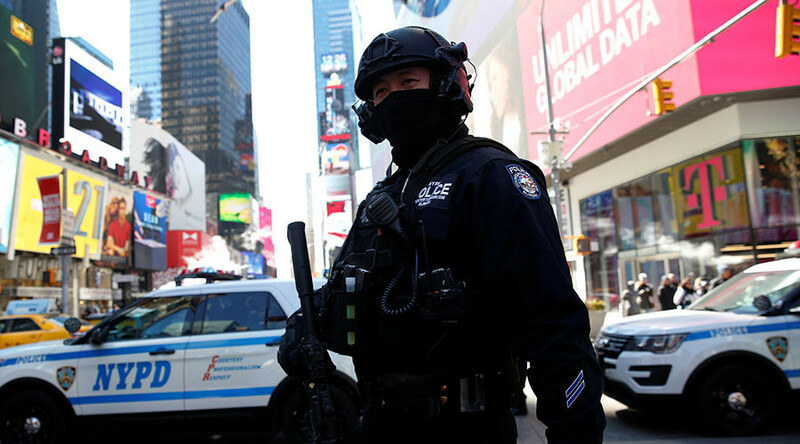 New York police have previously boosted security at prominent sites around the city after large-scale attacks in Paris, Brussels and San Bernardino, California, out of an abundance of caution, Police Commissioner James O'Neill said. London’s attack happened on the first anniversary of the Brussels terrorist attack when consecutive bombs killed 32 people and three perpetrators, and more than 300 people were injured. In the US, the White House said earlier that President Donald Trump was briefed about the incident, and the president offered its full cooperation and support to British Prime Minister Theresa May in responding to the attacks. Secretary of State Rex Tillerson expressed his condolences to the victims and their families on behalf of the United States. The Department of Homeland Security said it would lend support to the British investigation of the attack but that its security posture was unchanged.